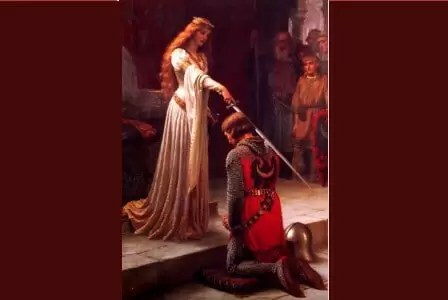 The Knights’ Code of Chivalry is inspired by the song of Roland, the Duke of Burgundy and the Code of Chivalry in the legends of King Arthur and Camelot. St. Francis was born in the spring of 1182 into nobility the son of Peter Bernardone and Lady (Pica) Domina (Donna). His mother descended from gentle nobility and his father was a wholesale cloth merchant. Francis was baptized while his father was away and given by his mother the name John Baptist. Upon his return, Francis’s father renamed him Francesco from his fond memory of “gentle France” where he had a profitable business. His early years were ones in which his mother gave him instruction due to his father being away on business. His elementary education came from the priests of St. George. Francis grew up happy and full of fun. He was seen by all as a much-pampered and luxury-loving young gentleman. Frederick Barbarossa the Emperor and Lucius III the Pope had dominated the world in which Francis was born. This was also the time of the crusades. His father wanted Francis to join him in his business endeavors, which in turn would cement his place in the feudal nobility and knightly estate. A knight came from both nobility and wealth. Due to the cost of equipping, a knight with men and horses was so expensive that only the wealth of nobility and commerce could sustain it. Many battles between feuding towns for control of commerce raged while Francis was in his teenage years. In 1202, the twenty-year-old knight Francis was captured in the battle between Collestrada and Ponte San Giovannis that is on the road to Assisi. He was taken to Perugia and imprisoned with the common soldiers. Over the next two years, Francis was among many prisoners who became sick. It was during this time that Francis reflected on his life and he developed a deep spiritual change. In the year 1205, St. Francis received two apparitions while in a half sleep. He had intended to return to his former position as a knight and find fame and glory. The apparitions he received became clear to him that his knighthood would be different from before. His knighthood was to be for God and His church. His master would be “Supreme Liege Lord,” or “Most High Emperor of heaven,” and he would be “servant” or “human liege man,” that is “feudal vassal.” Now filled with a holy enthusiasm Francis surrendered completely to the divine will. He returned to his native Assisi and removed his earthly armor and weapons and put on the armor and spiritual weapons of Christ in defense of Christ’s church. According to Thomas of Celano, it was a matter of honor for St. Francis to put his hands to deeds of valor. In all circumstances, he would prove himself as the most valiant knight of God. He was the captain of the new militia of Christ. On one occasion he was near the town of Rieti when he came upon a knight from the family of Tancredi. As he gazed eye to eye with the knight sitting upon his steed he knew all about the pride of wearing full shining armor ready for battle. “Sir Knight,” St. Francis said. “Armor, sword, and spurs are empty glamor. Would you like to wear a coarse rope instead of a girdle, the cross of Christ, instead of the sword, and the dust and dirt of the road instead of spurs follow me. I shall make you a knight of Christ.” This was the conversion of Brother Angelus Tancredi. In his time one of the weakest and most vulnerable members of society were the lepers. These poor souls suffered from a disease that literally rotted the flesh off their bones. As a young knight of the realm before his conversion, St. Francis did everything he could to avoid going near that part of Assisi. After his conversion St. Francis physically embraced them and gave them dignity, by expressing his Christian love for them. The clothes given these lepers were a grey habit with a hood and a cord to warn people that they were in the vicinity, of a leper. St. Francis is said to have modeled the garb of his followers after a leper’s garb. The Franciscan’s were to be as lepers. In the world, but not of the world. During the time of St. Francis, knights the Church exacted a vow from the combatants to use their weapons chiefly for the protection of women and their virtue, especially widows and orphans. St. Francis lived by this code of conduct during his time as a knight of the realm. With his new heavenly knighthood, he incorporated it into a spiritual protection from immoral acts against defenseless women and orphans. To this end, he gave food from his own want to fill their temporary hunger. St. Francis was traveling to San Domiano by way of the Umbrian plain to repair the church, which was in disrepair. He was wearing a simple poor man’s garment given him by Count Frederico Spadalunga. When he reached the church, he was greeted on the steps, by Father Do Pietro who gave a critical look at the young pilgrim. He wished that Francis would wear a religious garb. Francis was reluctant at first since he was neither a cleric or a monk. Not wishing to give offense Francis drew upon the acts of chivalry. He prepared a hermit’s garb for himself consisting of a long garment with a leather girdle, shoes, and a staff. He wore these for the next two years. 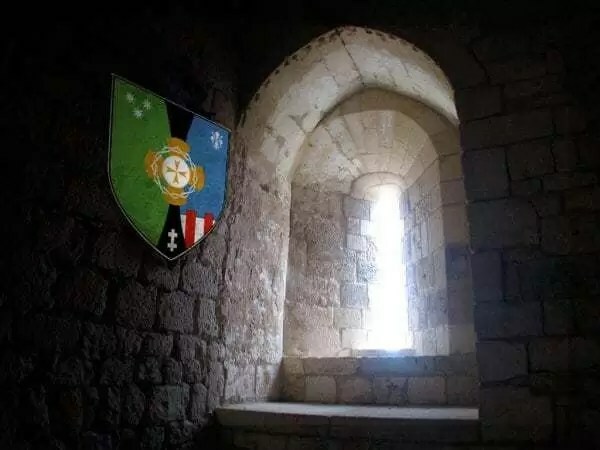 Duties to countrymen and fellow Christians: This encompasses virtues such as mercy, courage, valor, fairness, protection of the weak and the poor, and servanthood of the knight to his lord. This also brings with it the idea of being willing to give one’s life for another, whether he would be giving his life for a poor man or his lord. 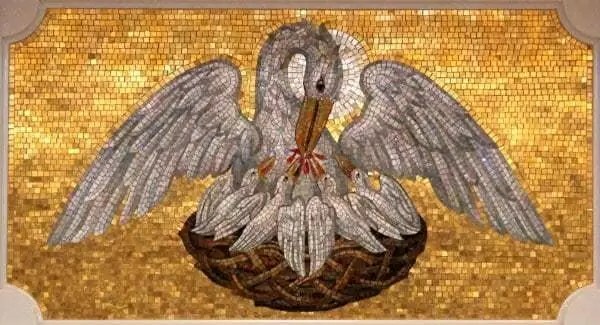 Duties to God: This would encompass being faithful to God, protecting the innocent, being faithful to the Church, being the champion of good against evil, being generous, and obeying God above the feudal lord. Duties to women: This is probably the most familiar aspect of chivalry. This encompasses what is often called courtly love, the idea that the knight is to serve a lady, and after her all other ladies. Most especially in this category is Our Lady, Queen of Heaven and earth. These areas overlap quite frequently and are often indistinguishable from one another. One similarity is honor, the foundational and guiding principle of chivalry; thus, for the Knight, honor is one guide of action. “For God and the Church” (K.H.E. Motto). To always have a holy fear of God that spurs us on for love of Him. Like St. Francis, we are to rebuild and maintain the spiritual and physical Body of Christ. Be mindful of Mother Angelica’s legacy of building up the Church. “[A Knight] is one who has made the interests of the King his own” (K.H.E. Customs). With valiant trust and self-sacrifice, a Knight faithfully pours himself out for his Lord. He is willing to die to himself and sacrifice his life for his Lord, like St. Francis and the saints. A Knight sees his King in the weak and defenseless around him and must fight for their legitimate rights. We must help those whose faith is weak. After the example of St. Francis, we are called to perform corporal and spiritual works of mercy. Defending the dignity of the human person, especially the unborn and the elderly, is to be foremost in the chivalrous heart. As sons of so loyal a Mother, we are to console the Sorrowful Heart of Mary, our Queen. St. Francis loved the lepers, who were “orphans” of society. As Knights, we are to bring comfort to exhausted priests who come to our door seeking a place to lay their heads. “To open one’s home or one’s heart to those sent by God is to receive God Himself” (K.H.E. Customs). The Knight is always to be courteous and merciful toward others. Having great charity and respect for all persons is to be our rule of life. St. Francis’ compassion for the lepers, the poor, and the neglected manifested the love of Jesus Christ. “A house filled with charity becomes above all a dwelling for the Most Holy Trinity. Yet more profoundly, the Most Holy Trinity becomes the true home of all those who live in love” (K.H.E. Customs). “Like a city set upon a hill, the follower of Christ is elevated as an example to other men” (K.H.E. Customs). A faithful Knight does all for his Lord and God’s honor and glory. “Living always in the presence of God, the Knight strives to ever live uprightly. Like a lamp raised aloft, he sheds light upon a darkened world simply by the holiness of his life” (K.H.E. Customs). We are the “salt of the earth” and “the light of the world” (cf. Mt. 5:13-16); and Jesus has called us to become “great saints” (Mother Angelica). Like the great Knight of Christ, St. Francis, we strive to follow and serve Our Eucharistic King with total dedication. A Knight serves and protects his “Lord not for profit, but from the kind of selfless loyalty that can only be called noble” (K.H.E. Customs). Like St. Francis, seeking treasure in the heavenly court of our King is to be the real desire of our hearts. First and foremost, the Knight battles for the salvation of all souls, especially his own. In imitation of our blessed Lord, St. Francis’ heart burned for souls, and so must ours. As friends of the Great King, we must storm Heaven with our prayers for an outpouring of abundant graces from the hands of our Heavenly Queen, Mary, Mediatrix of All Graces. A Knight submits himself in all things to the authority of those placed over him. In loving imitation of Christ our King, we are to have a great love for the Pope, Holy Mother Church’s Magisterium, the Church’s hierarchy, and all legitimate superiors placed over us. Even to his death, the Knight is ever to defend the Supreme Pontiff of Holy Mother Church. “Be subject for the Lord’s sake to every human institution, whether it be to the emperor as supreme, or to governors as sent by him to punish those who do wrong and to praise those who do right. For it is God’s will that by doing right you should put to silence the ignorance of foolish men. Live as free men, yet without using your freedom as a pretext for evil; but live as servants of God. Honor all men. Love the brotherhood. Fear God. Honor the emperor” (1 Pt. 2:13-17). In imitation of St. Francis, the Knights are to be imbued with a filial devotion to Mary, the Queen of our hearts, of whom we are slaves of love. 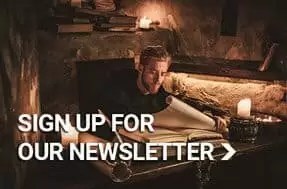 The Knight seeks always to protect the good name and reputation of his Brother Knights. As brothers in Christ our Eucharistic King, we are to be ever vigilant against the wiles of the devil as he seeks to destroy the souls and vocations of our fellow Knights. As an act of dying to himself, each Knight should lovingly and selflessly strive to place the needs and concerns of his fellow brothers in the first place at all times. The Knights are to avoid all that goes against charity, kindness, justice, and the truth, whether in thought, word or deed. “Knights should strive always to be cheerful and pleasant to all with whom they have contact, radiating the peace and joy that come from following Jesus” (K.H.E. Customs). “Courteousness and consideration should be exercised at all times” (K.H.E. Customs). The Knights’ “residence should be a place of peace. It should be a place where virtue habitually conquers vice, where pride yields to humility and charity cover a multitude of sins. It should be a place where truth is spoken, deceit shunned, and corrections gently offered and graciously received” (K.H.E. Customs). With ardent and prudent zeal, the Knight is to always be ready to defend and explain the faith which he professes. We are to profess and live out our faith in charity, for St. Paul tells us, “Faith without love is nothing” (1 Cor. 13:2). Being always in combat against Satan and his minions, a Knight is to ever have before his eyes the victorious crucified Jesus who has overcome all to ransom us from the claws of him who has been a liar from the beginning. We must daily pray to persevere in the Faith until our last breath. “Although it is faith and not vision that enables us to see that glory [of Heaven now, still, before the Eucharistic King, we partake even now in this life of that heavenly beatitude” (K.H.E. Customs). “A Knight of the Holy Eucharist should be mindful at all times of the obligation he has, as both a Christian and a Knight, to bear witness to the truths of the Gospel” (K.H.E. Customs). “Standing before Pilate, Jesus proclaimed that He had come as a witness to the Truth. And so the Christian after Him must take up the standard that He carried and bear witness as well” (K.H.E. Customs). A Knight is to live an asceticism that “is directed to freeing [him] from that which would hinder him from living in the truth” (K.H.E. Customs). We are always to speak the truth in charity. As we see in the life of St. Francis, “peace comes through the words of truth that cut through the devil’s dissimulations and the world’s entrapments” (K.H.E. Customs). “[T]ruth carries with it the joy and splendor of spiritual beauty. Truth is beautiful in itself” (Catechism of the Catholic Church). “[T]hat you should put away the old self of your former way of life, corrupted through deceitful desires, and be renewed in the spirit of your mind, and put on the new self, created in God’s way of righteousness and holiness of truth” (Eph. 4:22-24). We are to daily pray for the grace to persevere in our vocation and in the Faith, and thus become “great saints” in God’s eyes. With a diligent love, the Knights are to fulfill their daily tasks in unwavering service to our Eucharistic King and His interests. “In this, you rejoice, though now for a little while you may have to suffer various trials, so that the genuineness of your faith, more precious than gold which though perishable is tested by fire, may redound to praise and glory and honor at the revelation of Jesus Christ. Without having seen Him you love Him; though you do not now see Him, you believe in Him and rejoice with unutterable and exalted joy. As the outcome of your faith, you obtain the salvation of your souls” (1 Pt. 1:6-9). Like St. Francis and Mother Angelica, we must never compromise on issues of faith and morals. The Knights are to have a great and true devotion to Mary, the Mother of our Eucharistic King. As Knights of our Eucharistic King, we are to have a great respect for the honor of sisters, who are His spouses. In the age in which we live, the Knights, through the faithful living out of the evangelical counsels of poverty, chastity and obedience, especially chastity, manifest the beauty of celibate love and thereby help others to realize their own dignity as children of God. The Knights are always to build up their fellow brothers and all those with whom they come in contact. 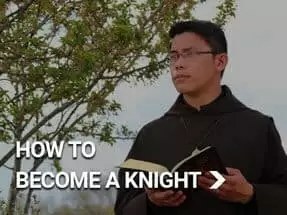 In imitation of St. Francis, the Knights are to humbly accept the words of correction which are offered to help them grow as persons and as children of God and sons of the humble Virgin Mary. As a soldier of Christ, the Knight must remain always vigilant against the temptations of Satan, the powers of the world, and the flesh. “Be sober, be watchful. Your adversary the devil prowls around like a roaring lion, seeking someone to devour. Resist him, firm in your faith, knowing that the same experience of suffering is required of your brotherhood throughout the world” (1 Pt. 5:8-9). 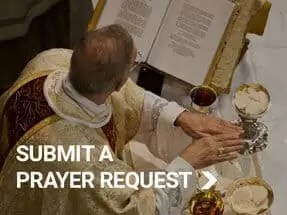 By imitating, to the extent our Customs allow, St. Francis’ life of penance and mortification, we are better able to combat the attacks of the devil. By faithfully living a sacramental life, the Knights are continually strengthened to live out their vocations in a state of noble sanctifying grace. To face the infernal enemy of our souls, the Knights are led in battle by the Prince of the Heavenly Host, St. Michael the Archangel. With knees ever bent before Our Eucharistic King, we fight on toward that great Day of victory which is Christ’s.